Solid Experience With a Winning Attitude. 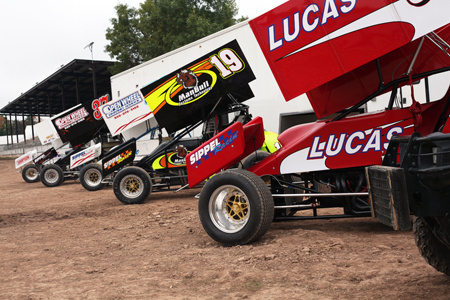 6 - Fully prepared MSA 360 winged sprint cars. • Peterbilt conversion tractor w/ United Expressline 54' car auto trailer. • 2 additional 32' United Expressline trailers and additional support vehicles. • 10,000 sq. ft. shop space to maintain present equipment and service customer equipment. Offers a variety of drivers the opportunity to race competitively without owning their own equipment. Car, crew support and transport are offered for a rental fee. Offers both experienced and non-experienced individuals a training and driving opportunity within a structured one day session. Randy Sippel has been active as a driver and builder of race cars and equipment for more than 35 years. Located in Elkhart Lake, WI, he has been building late models, winged modifieds, mini-sprints, midgets and sprint cars. As a driver he has been a competitor in the World of Outlaws Series, IRA Sprintcar Series, EWSC Winged Modified division and the WIMSA Mini-Sprint Series. The additional team members and crew reflect his dedication to the success of the drivers, students and overall racing program.